I think I'm kind of sick of macarons. I used to love them. They were the perfect bite sized piece of deliciousness. But now I'm over it. Maybe it was when it became impossible to actually buy anything from Adriano Zumbo due to his sudden Masterchef fame. Anyway, I've decided that nougat is the new macaron. 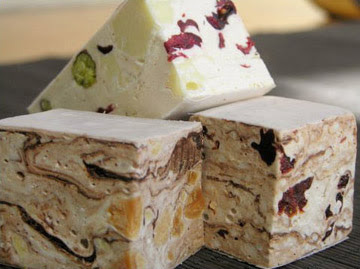 More specifically nougat from Nougat Royale. R arranged to have a dark chocolate, almond and cherry batch made up for my mum's birthday and it was melt in your mouth amazing. You can even order it the day before and have it delivered to your doorstep. Nougat for all!! the nougat is so addictive. Ben from Nougat Royale provided me 3kg of nougat! i did not get sick of it.